A hurricane wedding centerpiece offers many options for your reception decorations. You can fill them with many different things, and they are versatile enough to fit in with any type of wedding theme. Hurricane vases come in a few different sizes, styles and colors. They can be found at many craft stores, department stores and online, so shop around to find the style that is right for your wedding. You will want to choose hurricanes that match up well with whatever you are filling them with and the size of your reception tables. Flowers always work well in hurricanes. 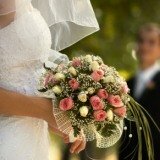 Work with your florist to match them with your wedding colors. Fill them with water and floating candles, and add stones or pearls to the bottom. Add pine cones with walnuts and potpourri for a Fall or Winter wedding. Use different types of fruit (dried or fresh) to fill them. Oranges and lemons work well for Summer, and apples work well in the Fall. 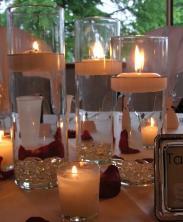 Add a votive candle and coffee beans or other small items to match your wedding theme color. Put pillar candles inside. This adds ambiance to your reception. 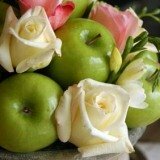 Wrap a wreath, berries or other floral arrangements around the outside of the hurricanes. For a Christmas or holiday wedding put round ornaments in them.